Mix the walnuts, raisins, sesame seeds, cinnamon, honey and egg yolk well. 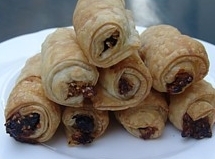 Brush each phyllo sheet with butter and put two teaspoons of the walnut mixture on one side. Roll op the sheets, brush them with melted butter and bake them 30 minutes at 170 degrees Celsius. Mix the flour with the butter, sugar, egg and chocolate and make a soft dough. Make 12 small heaps on a greased baking tray and bake the cookies 15 minutes at 175 degrees Celsius. 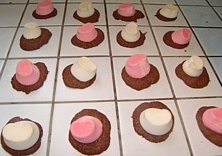 Put a marsh mellow on top of each cookie and bake 10 minutes more.